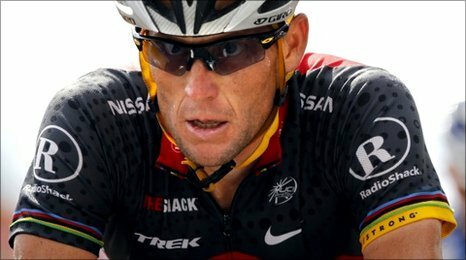 Lance Armstrong said his hopes of winning a record eighth Tour de France are "finished" after he lost nearly 12 minutes on the eighth stage. Armstrong fell twice and after losing contact with the leaders he lost more time all the way to the finishing line on Sunday's first mountain stage. Andy Schleck outsprinted Samuel Sanchez to win, while Britain's Bradley Wiggins was one minute 45 seconds back. Cadel Evans is the new race leader, 20 seconds ahead of Schleck. "My Tour has finished," said 38-year-old Armstrong after the 189km stage from Station des Rousses to Morzine-Avoriaz. "But I will stay in the race. "I will enjoy it, I'll try and take some pleasure out of it, to support the team. I'm not complaining." Defending champion Alberto Contador of Spain stayed with the leaders up until the final kilometre and after finishing 10 seconds behind he trails Australian world champion Evans by 1:01 in the general classification, and Schleck by 41 seconds. Omega Pharma-Lotto rider Jurgen Van Den Broeck is a further two seconds behind, with less than 10 seconds separating himself from Russia's Denis Menchov and Canadian Ryder Hesjedal. Wiggins, who stayed with the pace until the final three kilometres, is 14th overall, 2:45 behind Evans. "I felt good until the final climb, but just couldn't hold on at the end," said the 30-year-old Londoner. "I'm happy to admit that I wasn't quite good enough today, but there's still a lot of the race left so we'll see what happens." However, the day's major story concerned Armstrong, who is now 13:26 adrift of Evans. The American's woes began with six kilometres raced, when a domino effect from a crash at the front of the peloton forced him to swerve on to a grass verge. At the 140km (87-mile) mark, Armstrong fell as the peloton were navigating past a roundabout and needed his team-mates to bring him back to the main field. And the RadioShack rider was left fuming when he was unseated as a result of two Euskaltel riders colliding in front of him. "I've had a bad day, a very bad day. At the start, it was going OK, I felt strong," said Armstrong. "And then came the roundabout before the Col de la Ramaz. I clipped a pedal and then my tyre rolled off and the next thing I was rolling along the ground at 60 to 65kph. "It's already hard to come back, hard on the body." Evans takes over the race lead from Sylvain Chavanel, who was unable to stay with the leaders on the tough Col de la Ramaz. The Australian last wore the yellow jersey in 2008 when he held it for four stages. "I didn't want to lose too much time to Andy, but I'm happy to finish with Contador today and sitting here with the yellow jersey is not a bad position to be in," said the world champion. Stage winner Schleck gained 10 seconds on Evans with a late attack that left his rivals unable to respond. "I was right up there 100%, both physically and mentally. "It's a great victory for me, but now I'm taking aim at the yellow. "My aim is to have it when the race finishes in Paris. And to do that, we have to go step by step. It will come." He leads the young rider's classification by 1:25 from Liquigas's Czech rider Roman Kreuziger. Monday is a rest day before the peloton tackle the 205.4km (127-mile) ninth stage from Morzine-Avoriaz to Saint-Jean-de-Maurienne. It features the category-one climbs of Col de la Colombiere and Col des Saisies before the final climb of the day - the hors (toughest) category Col de la Madeleine. 3. Robert Gesink (Net/Rabobank) +10"
2. Andy Schleck (Lux/Saxo Bank) +20"
3. Alberto Contador (Esp/Astana) +1'01"
4. Jurgen van den Broeck (Bel/Omega Pharma-Lotto) +1'03"
5. Denis Menchov (Rus/Rabobank) +1'10"
6. Ryder Hesjedal (Can/Garmin-Transitions) +01'11"
7. Roman Kreuziger (Cze/Liquigas) +01'45"
8. Levi Leipheimer (USA/Radioshack) +02'14"
9. Samuel Sanchez (Esp/Euskatel) +02'15"
10. Michael Rogers (Aus/HTC-Columbia) +02'31"
14 Bradley Wiggins (GB/SKY) at 2'45"
39 Lance Armstrong (US/TRS) at 13' 26"
69 Geraint Thomas (GB/SKY) at 30' 51"
83 Charlie Wegelius (GB/OPL) at 41' 11"
117 David Millar (GB/GRM) at 50' 10"
135 Stephen Cummings (GB/SKY) at 55' 59"
149 Mark Cavendish (GB/HTC) at 1h 01' 23"
159 Daniel Lloyd (GB/CTT) at 1h 06' 53"
160 Jeremy Hunt (GB/CTT) at 1h 07' 22"